Castello di Amorosa Winery in the Napa Valley is a unique destination offering award-wining wines and authentic 13th century Tuscan castle tours. The castle, which took 15 years to built and cost nearly $40 million, has over 100 rooms, a medieval courtyard, watch towers, torture chamber and secret passageways. The castle has eight levels, four underground and four above ground. The Great Hall has a 500-year-old fireplace and 22 foot high ceilings with hand-painted frescoes which make you feel like you've been transported to medieval Siena, Italy. 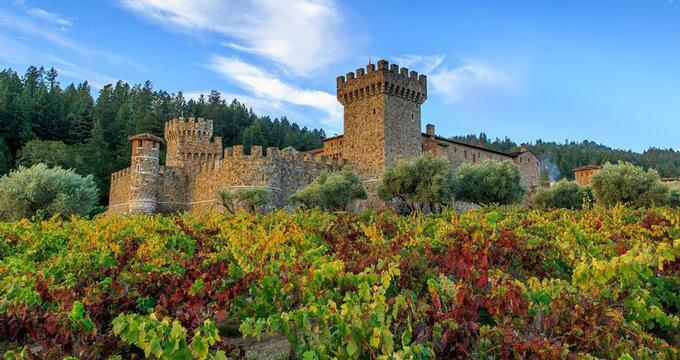 Castello di Amorosa Winery specializes in Italian-style wines. General Admission is $19 per person and includes access to parts of the castle and wine tasting in the main tasting room. If you want to learn more about the castle and enjoy private wine tasting, call ahead and book a Standard Tour & Tasting ($34 per person) which consists of a guided tour, followed by a tasting of five of their Premium Wines in one of the private tasting bars. Visitors also enjoy complimentary tasting of the current releases. Other castle tour options include "Young Adult Tours" for families with children ages 5 to 20; and Tour & Upgraded Reserve Tasting which lets you taste the winery's high end Reserve Wines. Fun upgrades include a wine tasting paired with chocolate; Cheese Pairing featuring cheeses from Scotland to Italy, and Charcuterie Pairing. The winery is located in the northern part of the valley, between St. Helena and Calistoga. It is open daily from 9:30am-6:00pm March-October and 9:30am-5:00pm November-February. General Admission does not require reservations.